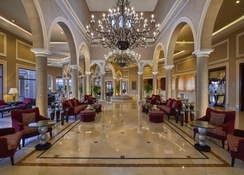 Looking for a luxurious beachfront stay in Sharm el Sheikh, Egypt, where you can enjoy magnificent views of the Red Sea? Then the multiple award winning five-star Jaz Mirabel Beach Hotel is the right choice for you. Located in South Sinai on the shores of Nabq Bay, this all-inclusive family friendly property is just 10 minutes away from the Sharm el Sheikh International Airport. The hotel blends Tuscan architectural style with warm Egyptian service to provide you matchless luxury and a truly rewarding stay. The hotel stretches down to a private beach, so you’re just footsteps away from the Red Sea. The medley of international cultures isn’t just reflected in the rooms. The hotel’s dining and drinking scene melds a variety of influences – from the Middle Eastern flavours of the in-house restaurant Sofra to the international beats at its nightclub Glow. 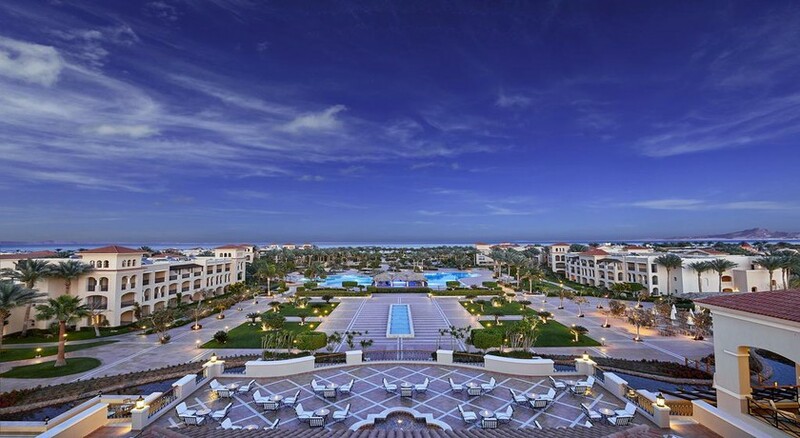 Boasting a private beach, Jaz Mirabel Beach ensures you’re just a stone’s throw away from the Red Sea. Stay in modern stylish rooms, select from the hotel’s impressive choice of restaurants, snack bars and beach bars serving local and International cuisines, or buy souvenirs in the 76 shops at the on-site Souk Mirabel – you’ll never run out of things to do at Jaz Mirabel Beach. There are also bundles of leisure options available: four large swimming pools, two kids’ pools, water adventure park with five slides, indoor and outdoor sports, gym, Jacuzzi, spa and wellness centre. Watersports enthusiasts can enjoy scuba diving, snorkelling, surfing, boating and parasailing. Jaz Mirabel Beach Hotel boasts a spectacular location on a lagoon in Nabq Bay, so the golden sands and the glittering Red Sea is right in front of the hotel. The destination is famous for snorkelling, scuba diving and many such other water activities, and there are watersports centres to help you get involved. 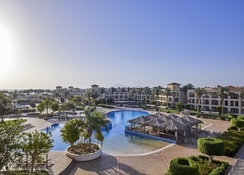 Ideal for families, couples and large groups of travellers, the deluxe Jaz Mirabel Beach Hotel is just 10 km away from the Sharm el Sheikh International Airport and there is an array of hotels, restaurants and clubs around the property. There are also regular shuttle buses to and from Naama Bay. There are 645 well-appointed rooms and suites on offer at Jaz Mirabel Beach Hotel, Sharm el Sheikh that are divided into four categories: 102 Standard Rooms, 60 Superior Rooms, 480 Family Rooms and 3 Executive Suites. All the guestrooms are spacious and stylishly designed to offer maximum comfort and relaxation to guests. The rooms come with furnished balconies or terraces offering scenic views of the Red Sea, pool or the hotel garden. The amenities provided across all categories of rooms include air conditioning, luxury en-suite bathrooms, shower, bathtub, hairdryer, TV with satellite, minibar, phone and tea and coffee making facilities. Executive Suites come with a few extras, including two LCD TVs, a kitchenette, a swimming pool with sunbeds, dining table and a second bathroom. Jaz Mirabel Beach Hotel has an impressive array of restaurants including family friendly and adults-only options. It houses two buffet and four a la carte restaurants. The family friendly Al Zaytoun and the adults-only El Nakheel restaurants serve gourmet cuisine ranging from international delicacies to Middle Eastern specialities, with indoor and alfresco seating available. Among the four a la carte restaurants, Sofra serves Middle eastern delights, Nino’s specialises in Italian cuisine, Makai Tukai dishes up Asian and Far Eastern specialties, and Moonlight Dinner is a steak restaurant open only in summers. There’s also a food court near the beach, serving light snacks and beverages. Jaz Mirabel Beach houses a choice of lobby bars, pool bars and beach bars: take your pick from Blue and Las Palmas Pool Bars, Sand Beach Bar, Coral and Reef Snack Bars, Oriental Flair lobby lounge, the adults-only Shurouk Lobby Bar, all of which serve all kinds of beverages throughout the day. Night owls (only 18+) can flock to Glow Disco and dance the night away. A paradise for those looking for ultimate relaxation as well as fun-filled, healthy dose of action, Jaz Mirabel Beach Hotel offers loads of activities to choose from. There are four large swimming pools with loungers and parasols, two of which are heated during winters. Sports lovers can enjoy beach volleyball, billiards, tennis, table tennis, archery and darts. The hotel houses a health club that features a fully equipped gym and Jacuzzi. There’s also a spa, complete with nine treatment rooms. Water lovers can enjoy scuba diving, snorkelling, surfing, boating and parasailing – there are diving and water sports centres on the beach. For guests aged between 4 and 12 years, there are two children’s pools, five water slides and two jungle playgrounds. The hotel offers adrenaline-pumping aqua slides for both adults and kids. The kids’ club is led by the in-house animation team that arranges ample entertainment opportunities throughout day and night. The hotel has a local amphitheatre that hosts live shows and a market called Souk Mirabel housing 75 shops, cafés and bars.